Dedicated to Lord Jagannath or Shri Krushn (Krishna), the famous Jagannath Temple is located in the coastal town of Puri, Odisha. The Jagannath Temple is one of the Char Dham pilgrimages and devout Hindus expect to visit this temple at least once in their lifetime. The temple is also associated with the Chariot festival or Rath Yatra in which the three primary deities of the temple are carried on the exquisitely decorated chariots, which are pulled by thousands of ardent devotees. The temple is especially significant for the devout followers of the Vaishnava and Gaudiya Vaishnava traditions. Both Chaitanya Mahaprabhu and Saint Ramananda have been closely associated with the temple. 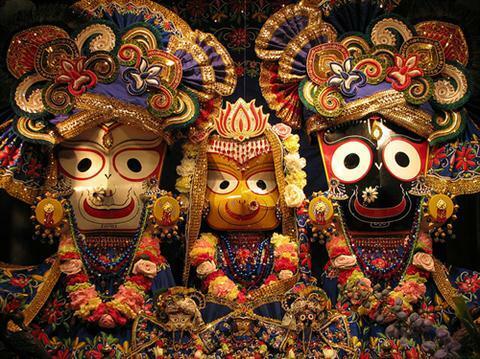 The word ‘Jagannath’ literally means the ‘Lord of the Universe’. As per evidence gathered by archeologists from some antique copper plates, dating back to the Ganga Dynasty, the Jagamohan and Viman sections of the Jagannath Temple were constructed during the reign of Anantavarman Chodaganga Dev. However, the temple was renovated during the reign of Anang Bhima Dev in 1174. As per some theories proposed by a few eminent archaeologists, the Jagannath Temple was built upon a pre-existent Buddhist Stupa. The Stupa was believed to have housed the tooth and some relics related to Lord Buddha. During the rule of the Somavasi Kings of Odisha, Buddhism was steadily gaining popularity and hence the worship of Lord Jagannath also gained momentum. The great Sikh emperor, Maharaja Ranjit Singh, had made tremendous contributions to the Jagannath Temple. His donation to the Jagannath Temple is believed to have surpassed his contributions to the Golden Temple in Amritsar. He even wanted to donate the priceless diamond, Kohinoor, to the temple, but was unable to do so. The Jagannath Temple was even in existence when the Afghan General Kalapahad attacked Odisha. As per legend, the original image of Lord Jagannath was discovered in the form of Indranil or the Blue Jewel, near a fig tree. The image was hidden by Dharma under the surface of earth, owing to its bright and shining characteristics. Malwa’s King Indaryumn wanted to recover the hidden image and therefore he performed tough penance. After a while, Lord Vishnu appeared before him and directed him to visit Puri and carve an image of the Lord from a piece of log found floating in the sea. After following the directions of Lord Vishnu, King Indrayumn discovered that Lord Vishwakarma suddenly appeared as a sculptor and out of the piece of log carved out the images of Jagannath, Balabhadra and Subhadra. The Shrikshetra of the Jagannath Temple, as it is very popularly known, is a true reflection of the Indian culture and ethos. Lord Jagannath was worshipped by the Savaras, as an avatar of Lord Narayana. As per other accounts, Lord Jagannath was the Nilamadhava, a blue stone image of Lord Narayana worshipped by the aboriginals of Odisha. This Nilamadhava was shifted to the Nilagiri or the Blue Mountains and thereafter Lord Jagannath was installed there in the companionship of Subhadra and Balabhadra. These three deities are claimed to be the representations of Samyak Darshan, Samyak Jnana and Samyak Charita, the Trirath of Jainism. The assimilation of these three representations is believed to provide ultimate bliss or the Moksha. Lord Jagannath is also worshipped as Lord Vishnu, Lord Narayan, Lord Krushn, Vairav (Lord Shiva) and Vimal (Bhairavi, the consort of Lord Shiva). Thus, the Jagannath Temple symbolizes the fusion of Shaktism, Shaivism and Vaishnavism with Buddhism and Jainism. It is also believed to be representative of the amalgamation of Hindu and tribal cultures. Covering an area of almost 400,000 sq. 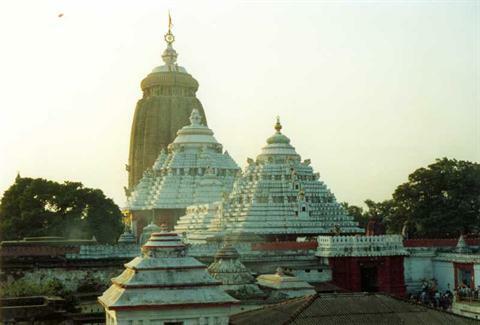 ft., the Jagannath Temple complex is host to around 120 temples and is fortified with high and strong walls. The temple complex is a masterful testimony of the Orissan style of temple architecture. The eight spoked wheel or the Srichakra, adorns the top of the temple and the temple complex is curvilinear in structure. The Srichakra is also known as the Nilachakra and made from the sacred Ashtadhatu alloy. The temple tower rises to a height of almost 214 feet. Besides the main temple, the primary shrine of the temple complex is encircled by a 20 feet high wall. The Singhadwar or the Lion Gate is the main entrance of the temple complex. Two huge crouching Lion statues flank the main entrance of the temple complex and hence the nomenclature. The entrance gate on the eastern end is called the Bada Danda or the Grand Road. The sacred twenty two steps, also known as the Baisi Pahacha, directly lead to the temple complex. The image of Lord Jagannath, also called Patit Pavan or the Saviour of the downtrodden and the fallen, adorns the entrance. The two legendary temple guards i.e. Jay and Vijaya, are sculpted onto either side of the doorway. The sixteen faceted monolithic pillar, also known as the Arun Stambha, faces the main gate of the temple complex. Besides the Singhadwar, the other entrances of the temple complex are known as Hathidwar or the Elephant Gate, Ashwadwar or the Horse Gate and the Vyaghradwar or the Tiger Gate. Numerous Mandaps, pillared halls standing upon raised platforms, are housed in the Jagannath Temple complex. The Mandaps essentially serve the purpose of religious congregations. One of the most important Mandaps, the Mukti Mandap, serves as a congregation hall for the temple attendants or Sevayats. The Dol Mandap is the place where the Dologobinda is placed upon a swing during the Dol Festival. The Snana Bedi is a raised stone platform on which the bathing ritual is performed for Jagannath, Subhadra and Balabhadra. The deities of Jagannath, Balabhadra and Subhadra are placed upon the embellished platform, Ratnavedi, inside the Inner Sanctum of the temple. The images are carved out of Neem wood. The Sudarshan Chakra and the images of Lord Madanmohan and Bishwadhatri are also placed on the bejeweled Ratnavedi. Lord Ganesh is worshipped in the Kanchi Ganesh temple. Goddess Mahalakshmi, who is believed to directly supervise the food prepared and offered to Lord Jagannath, is regularly worshipped in the Mahalakshmi temple. Ratha Yatra is the most important festival of the Jagannath temple and is celebrated in the month of June. The images of Jagannath, Balabhadra and Subhadra are carried on huge Chariots by thousands of ardent devotees and travels through the Bada Danda to the Gundicha Temple. During the Nabakalevara festival, held every twelve years, the wooden images of the holy trinity are replaced with new ones. The Chandan Yatra festival, celebrated during the Akshaya Tritya, marks the beginning of the construction of the Chariots to be used during the Rath Yatra. The other major festivals of the Jagannath temple are Jhula Yatra and Dol Yatra. The kitchen unit in the temple complex is in itself a grand affair and is one of the largest community kitchens of the country. As per legend, it is believed that Goddess Mahalakshmi herself supervises the food to be offered to Jagannath. It is believed that if a dog is spotted near the temple complex, it symbolizes that the food is not up to the mark and therefore fresh preparations are initiated after disposing the previous offering. The food to be offered is prepared by strictly adhering to the standards established in the Hindu texts. The temple cooks, also known as Mahasuras, prepare the food only in earthen pots and the water used for the preparation is fetched from two allocated wells named as Ganga and Yamuna. The offered food is thereafter distributed amongst the ardent devotees in the Ananda Bazar facility of Singhadwar.